Stone fruits are coming into season, hallelujah! 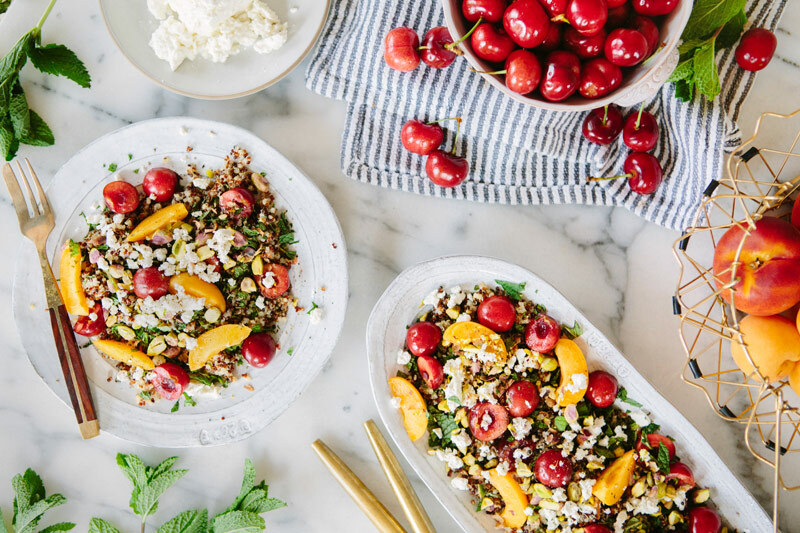 Cherries are my favorite of all of them- and since they’re so expensive and in season for such a short time they’re like juicy, extra-coveted little gems to me! The amount of flavor in each one reminds me how magical this world is- how incredible it is that the earth provides us with such a vast amount of things to eat, taste, enjoy. We’re lucky ones! Prepare dressing by combining shallot, olive oil, orange juice, apple cider vinegar and sea salt in a small bowl. Add salt to your taste. Prepare apricot by removing stones and slicing into half moons. Spoon quinoa/mint mixture onto a serving plate. 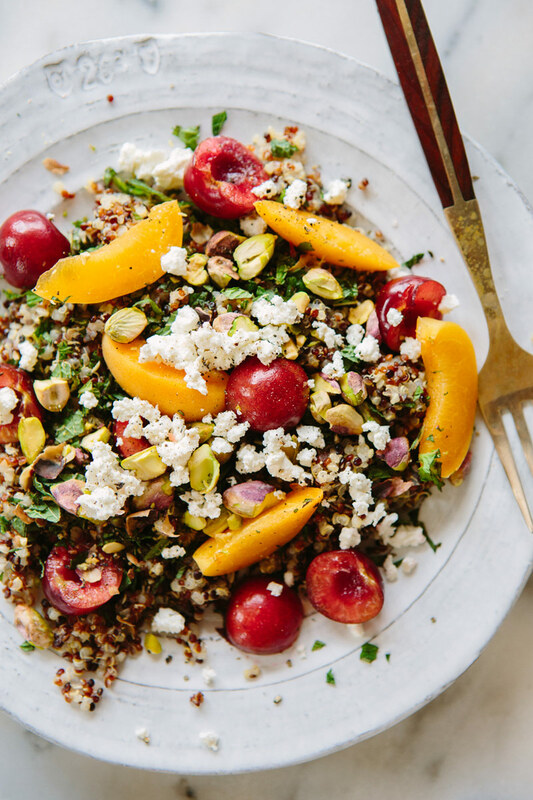 Tope with cherries, apricots, pistachios and sheep's milk feta. Drizzle with a little additional dressing, sprinkle with fresh cracked black pepper and Maldon salt. This is so beautiful and has so many gorgeous colours! Stone fruits are my favourite so I love this! This dish is beautiful! 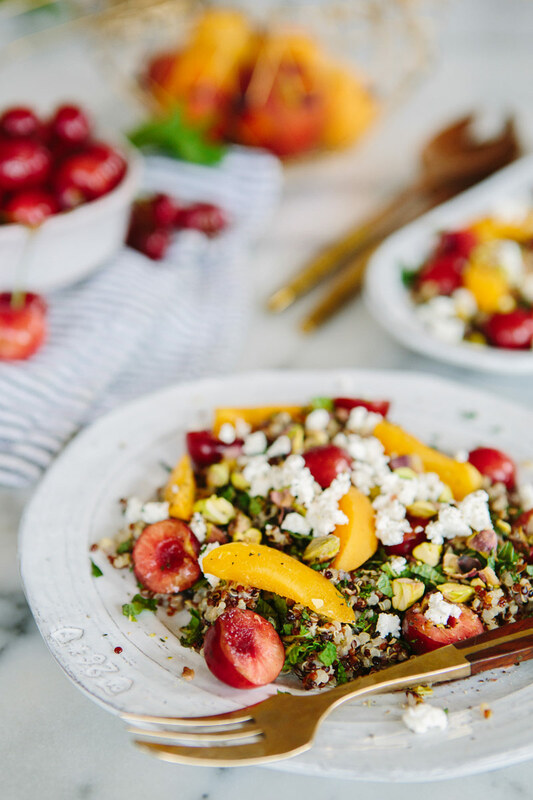 I don’t think I’ve actually ever tried an apricot before, but this salad is inspiring me to give them a try! Pinned! Woot! Woot! Happy dance that stone fruits are coming back into season. Cherries and peaches are my very favorite fruit. And throw them in a salad with some mint and quinoa. . .and my eyes start to bug out. Yum! I have to try this! How many does it serve? Wow, this looks amazing! Apricots and cherries together sound great. I might need to make this! Thank you for sharing! What a beautiful AND delicious salad!! Tried it last night and what a hit with everyone! This looks amazing!! Holy cow, I can’t wait to try it. I’m so late commenting on this but it looks amazing. Can’t wait to try it!